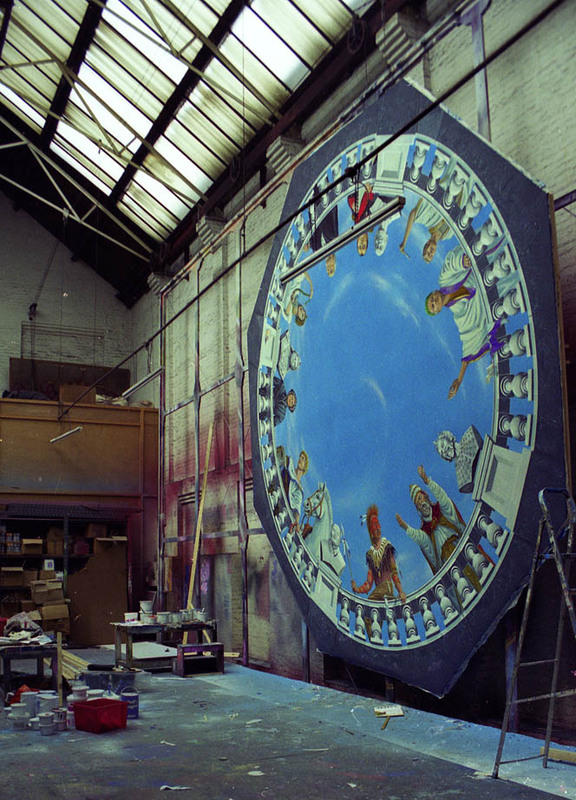 I have over the years designed and painted many theatre backdrops, 10 or more ballets for the National Youth Ballet, which gives ballet-mad kids a chance to perform on a big London stage. Alas I have few records of this work and almost none of the final results. I have done murals here and abroad some of which I have included pictures of. 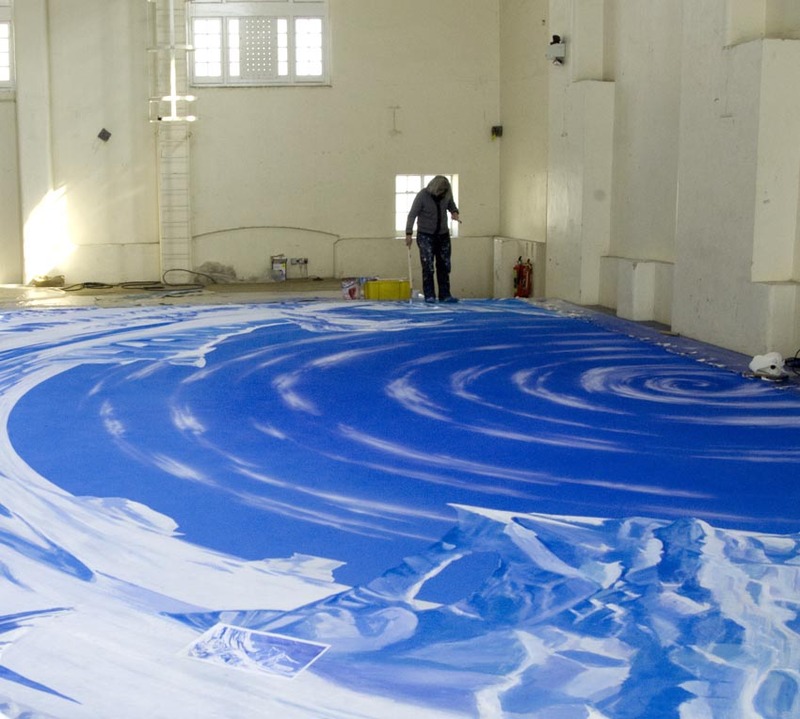 Large canvasses are either painted on the floor or upon a paint frame. There are alas fewer and fewer paint frames in operation, I used to work at the beautiful Elms Lesters Painting Rooms in Flitcroft St Covent Garden, but now it is the home of contemporary artists as an exhibition space. Large format digital printing is eating away at the scenic artist’s business, in the end I fear the skills will be lost. I have put some images below of paintings I have done over the years, where possible I have added an image of the process itself. The other method is to paint on the floor, which is not so hard as you might imagine, we tape our brushes to sticks and put the paints in trays that sit on the canvas… kicking over the paint is, as you might imagine, a disaster. I’ll start with one done recently by this method. I made a special effort to take a few pictures. Here is the small scale design for a recent ballet cloth. The production is The Rainbow Bear based on the book by Michael Morpurgo, and will be danced by the National Youth Ballet. I painted the model (the reference drawing is called the model) on the computer in photoshop. 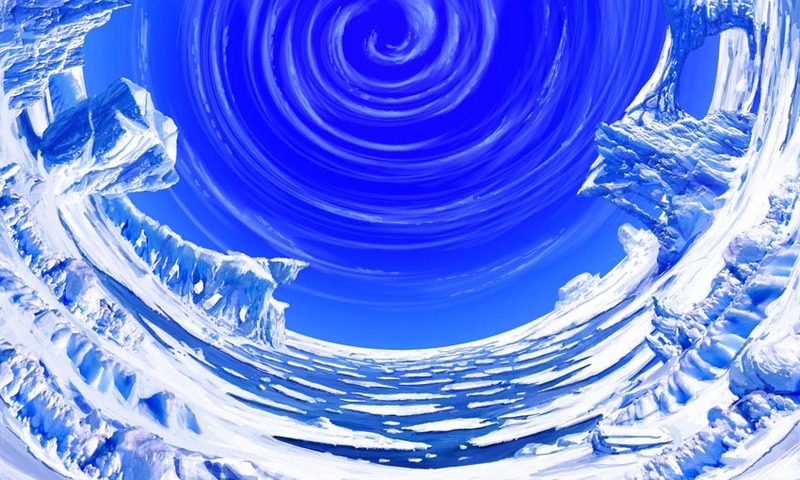 I wished to get the wide open top of the world feel so I wrapped the image into an arc. This was definitely one to paint on the floor, painting on a frame would have meant a cricked neck with the weird angles! 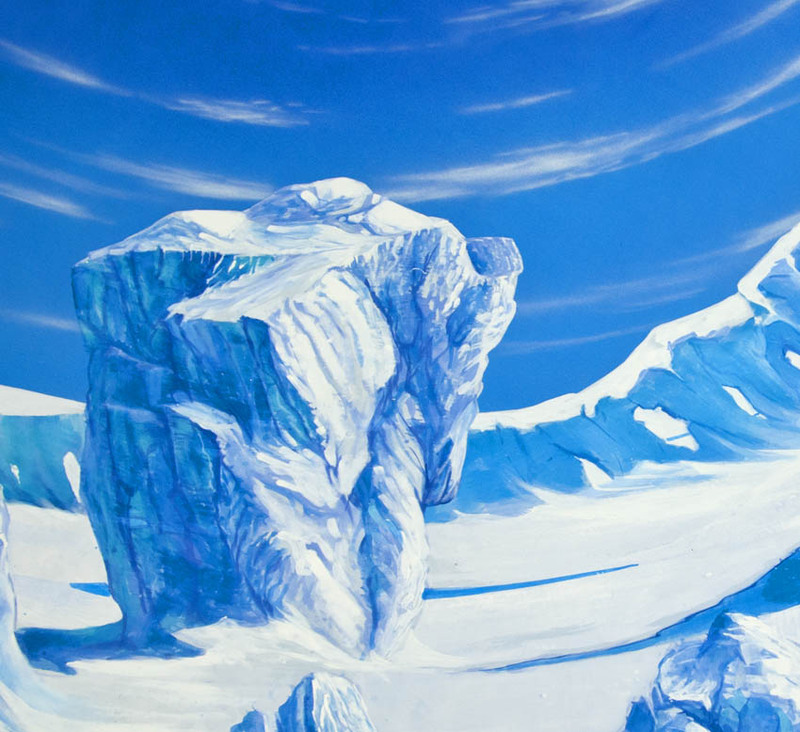 Here you can see my friend Anna painting an iceberg at about a half way stage, everything is blocked in ready to be refined. It is important a theatre cloth remains soft, so the work is done using the paint as thinly as possible rather like a watercolour. This cloth is 40ft by 24 ft in old money. Here is a photo of the final cloth, fortunately the space we were painting in had a gantry in the roof so I could get this shot. The light wasn’t great so it’s a bit grainy. Often you can’t get back from your painting which means you have to rely on experience to know if the whole thing is working. Here is a close up, as you can see it is painted quite freely, there is no need for your small sable on a painting this size! 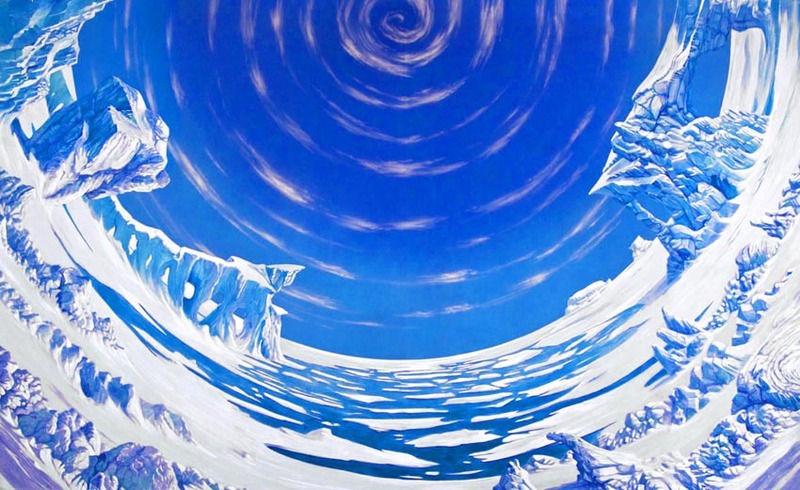 The big challenge painting wise was to get the glassy feeling to the ice. Everything had to be kept very high key. 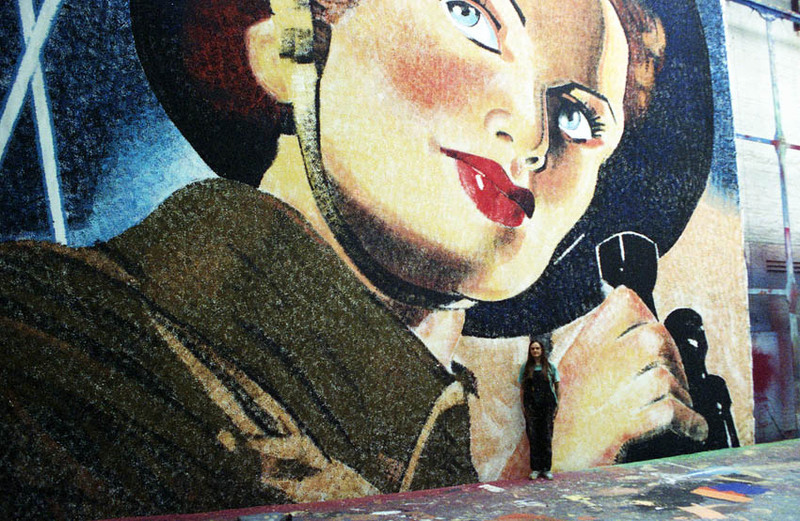 Here is an even bigger painting, my friend and fellow artist Sue is in the picture to give the idea of scale. This was only one cloth of 10 or so and you can only see the top half… Projects of this size are very much a team effort, there were four of us on this epic. It was for The VE celebration in Hyde Park London in 1995 as I recall. Here is a clearer view of the paint frame on a different job. The canvas is attached to a large frame that sinks into the floor. This is an 18C frame the modern ones have moving gantries and are not as good. The added factor for this painting was that I had to make a rotating stretcher so I didn’t have to paint historical portraits upside down! 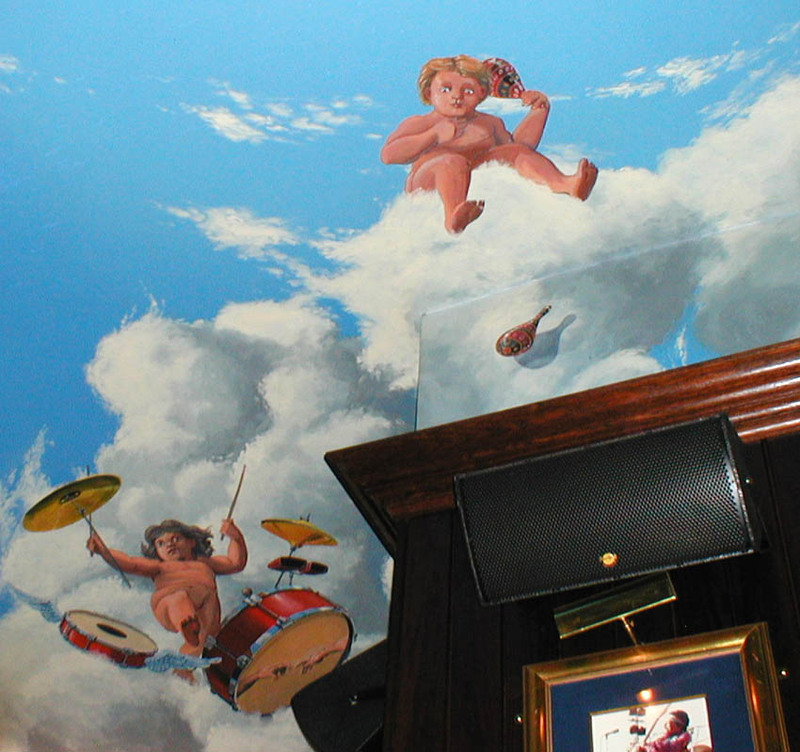 It was for a ceiling mural in Madame Tussauds in New York and is still there as far as I know. Here is the finished thing, I was sick of painting balusters by the end! It took 2 weeks to complete. 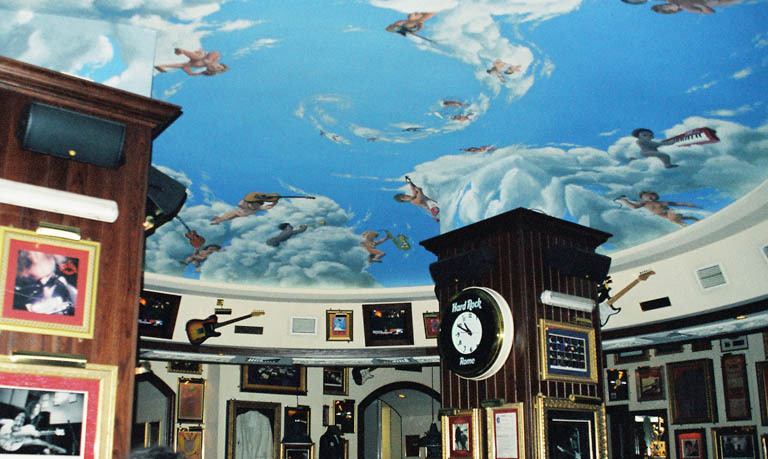 Here is a mural that had to be painted on site on a domed ceiling in the Hard Rock Cafe in Rome. This was a wonderful job that required me to be in Rome for 4 weeks. 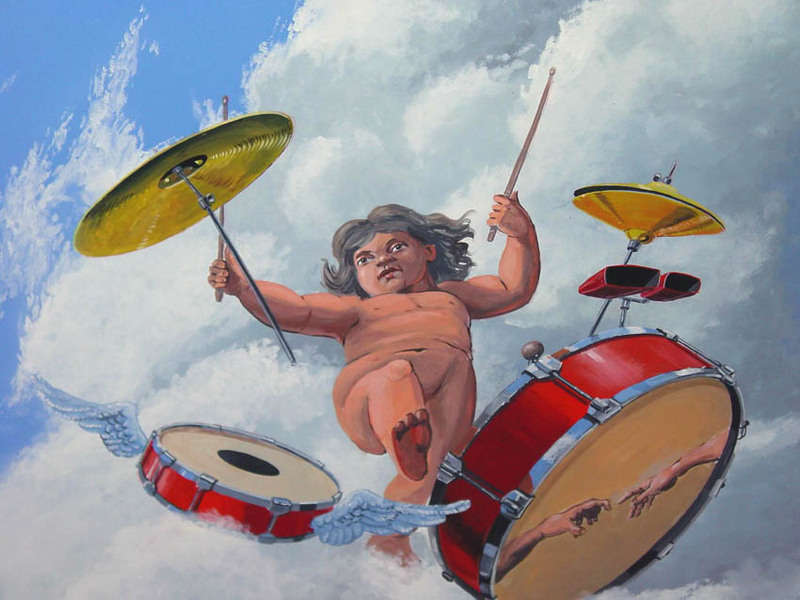 I did the initial design in acrylics which I have now lost, and then did many studies of putti actual size to be traced on by pricking and pouncing with chalk in the traditional manner. I had to paint the whole thing lying on my back on a scaffold tower, which was quite a challenge… the paint drips on your face and runs down your arm. But the painting was so engrossing I soon stopped noticing the discomfort. Lastly a couple of close ups, in my imagination all the putti were all different rock stars which was which I’ll keep a secret! 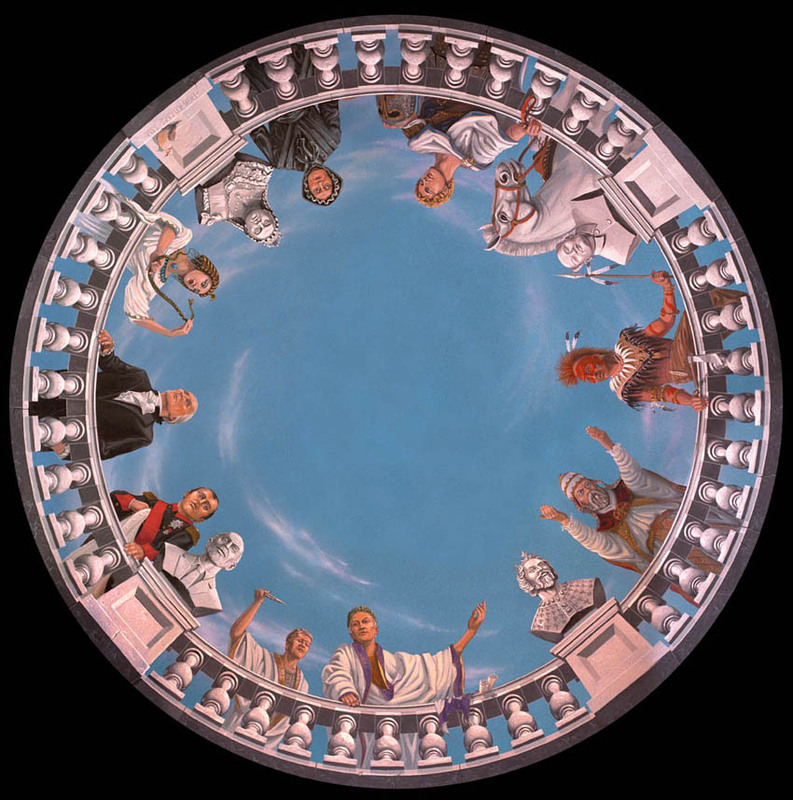 On the drum I’ve paid tribute to another ceiling painter in Rome! If his Holiness reads this I’m available, that chapel ceiling needs bringing up to date.